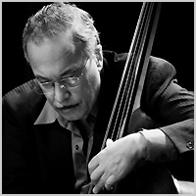 Legendary bassist and two-time Grammy ® award winner EDDIE GOMEZ has been on the cutting edge of music for over four decades. His impressive resumé includes performances with jazz giants such as Miles Davis, Dizzy Gillespie, Bill Evans, Gerry Mulligan and Benny Goodman. 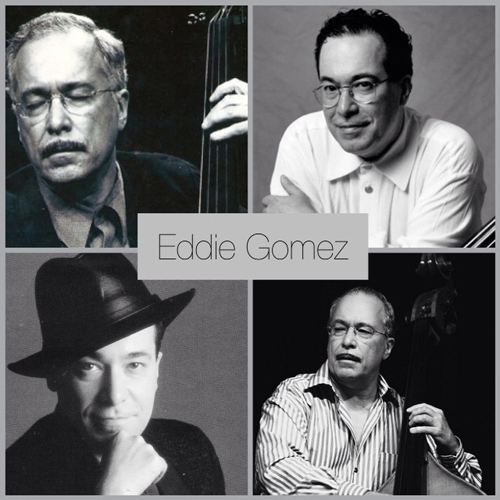 Eddie’s unique sound and style can be heard on many Grammy winning records as well as on hundreds of recordings spanning the worlds of jazz, classical, Latin jazz, rhythm & blues, popular and contemporary music. jazz community took notice. For 11 years, Eddie played an integral role in the Bill Evans Trio’s sound and evolution. This period of vast artistic growth with Bill Evans included performances throughout the United States, Europe, South America and Asia, as well as dozens of recordings – two of which won Grammy Awards. 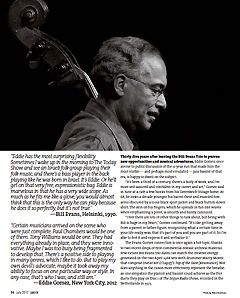 During this time, Eddie also realized another dream performing on many occasions with the great Miles Davis, in the Davis quintet that also featured Wayne Shorter, Herbie Hancock and Tony Williams. In 1977, Eddie left the Evans Trio to explore new musical territory. For the next decade, he performed in many diverse musical contexts, working with Dizzy Gillespie, Freddie Hubbard, George Benson, McCoy Tyner, Hank Jones, Nancy Wilson, Tanya Maria, the All Star groups “Steps Ahead” and “New Directions” and many others, as well as on Grammy-winning recordings with Chick Corea. In the classical music world, Eddie has been a guest artist with The Kronos Quartet, Tashi Ensemble, Japanese marimbist Mika Yoshida and clarinetist Richard Stoltzman. His recordings with Stoltzman have included “Begin Sweet World” and most recently “The Goldberg Variations” and other pieces by Johann Sebastian Bach. At Carnegie Recital Hall, Eddie premiered a musical piece written specifically for him by William Thomas McKinley. a member of “The Gadd Gang,” Steve Gadd’s All Star R&B/jazz band. 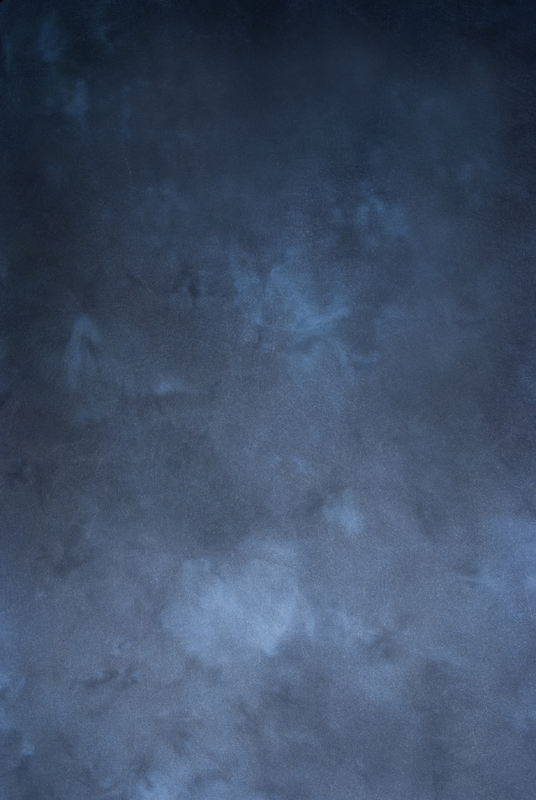 on the intricacies and dynamics of improvisation. 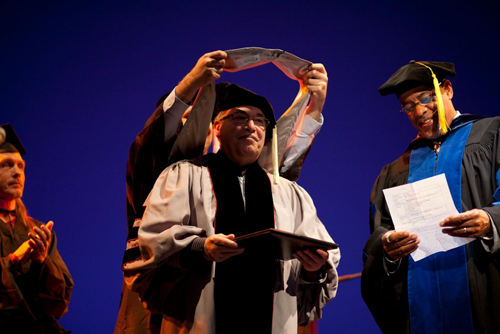 Grammy Award-winner Eddie Gómez was awarded at Berklee's campus in Valencia, Spain. 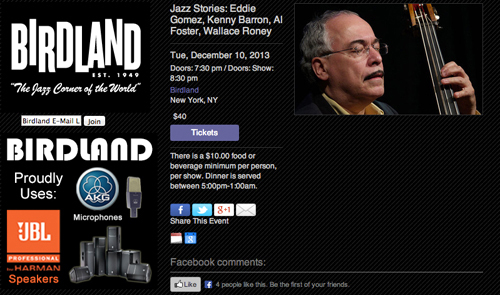 NEWS: 2013 December 10-14 Eddie Gomez at Birdland in NYC! Best instrumental album: "Further Explorations," Chick Corea, Eddie Gomez & Paul Motian. 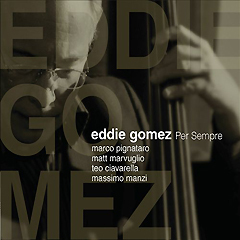 Legendary Bassist/Composer Eddie Gomez Releases New Recording "Per Sempre"
Download the PDF of Eddie Gomez interviewed in JAZZIZ magazine! 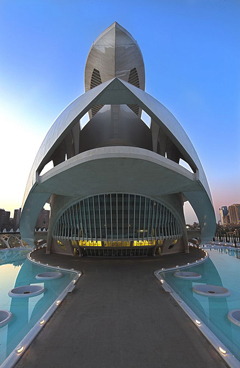 At Berklee In Valencia, Spain!